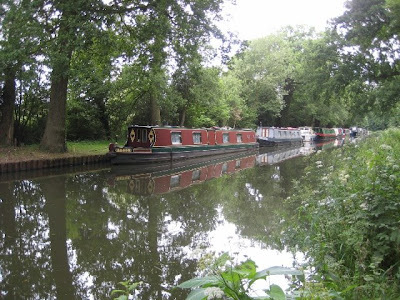 Wissy's blogspot: Walking the Wey. Newark Lock on the canal. Carrying on my theme of walking the locality and seeing things that you would not normally see, I went on a walk through the villages of Ripley and Pyrford taking in part of the Wey navigation canal on the way. The navigation has much history being officially opened in 1653. For nearly 200 years the Wey Navigation route linked the area with London, until it was superseded by the railway. 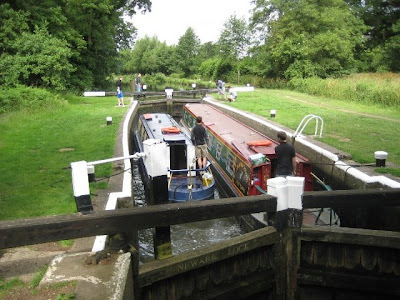 The canal by providing almost 20 miles (32 kilometres) of navigable water connecting the county with London, ensured that Surrey became one of the wealthiest and most influential areas in Britain. A legacy of the navigation canal are the towpaths that were built for the horses, carters, and bow-haulers that used to work the river and it was along these that I walked early one morning. Narrow boats moored along the canal bank. Even at an early hour there was activity on the waterway. I encounted several joggers, various dog walkers and the odd angler. Along this stretch of the canal many narrowboats are moored and as I walked several passed me going up and down stream. This part of the canal system is owned and maintained by The National Trust and everything is kept in fantastic order for the enjoyment of everyone who cares to walk the towpath. 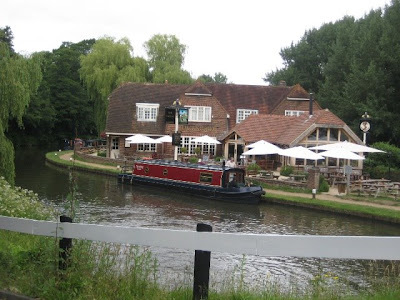 The 'Anchor' pub at Pyrford lock. Alongside the Wey Navigation Canal set amongst water meadows are the remains of Newark Priory. 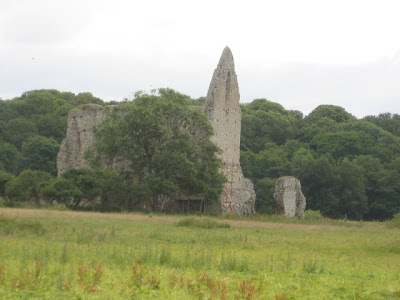 The priory was founded in the early 12th century by Augustinian Canons, or ‘Black Canons’ with descriptive reference to the black hooded cloaks and cassocks they wore. The Priory in its heyday was a significant complex of buildings surrounding an important church. The Black Canons went on to found the St Thomas’ and St Bartholomews’ hospitals in London. The priory, which at its peak was home to a community of 200, fell into ruins after it was sacked on the orders of Henry VIII at the Dissolution, and having been systematically stripped for building materials over the ensuing centuries all that now remains is part of the great church. Just up a hill from the priory is the delightful 12th century Church of St. Nicholas with its tranquil interior and original red ochre frescoes. Built of ‘puddingstone’ and dressed with ‘clunch’ the church’s wall paintings depict scenes from the flagellation and the Passion c.1200. The Church of St.Nicholas was built around 1140 AD and is a fine example of a complete Norman church. Just out of interest the name Pyrford originates from the ancient Saxon language ‘pyrianforde’ meaning a ford by a pear tree or orchard. On a personal level this is the church where I got married! 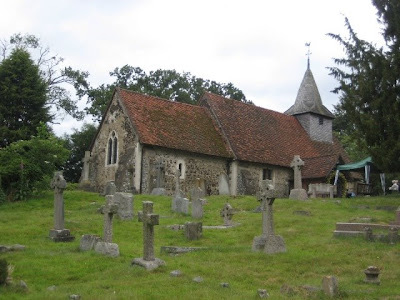 The 12th century church of St. Nicholas at Pyrford. 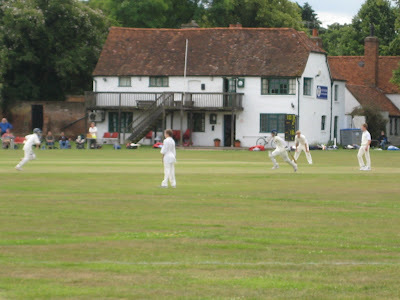 An English scene - cricket on Ripley village green.